We enjoy a good beer. Real beer. I had a bit of a chuckle when I was reading an article about the legal battles between American Budweiser and the real Czech Budweiser. The Czech beer has the characteristics of a good flavourful beer. The American one does not. What made me chuckle was a gentleman from the, I believe, Britain for Real Ale mentioned that the people in the UK can in fact tell the difference between the two beers because the “clean taste” of the American Budweiser is in fact no taste. Fortunately in the past decade or so there has been a real rise in America of Micro Brews and home brewers. In fact, there is a shop down the street from us that sells all sorts of micro brews and imports. It’s both wonderful for the taste buds and bad for the wallet at the same time. They also sell kits to make your own beer. Which we take advantage of. 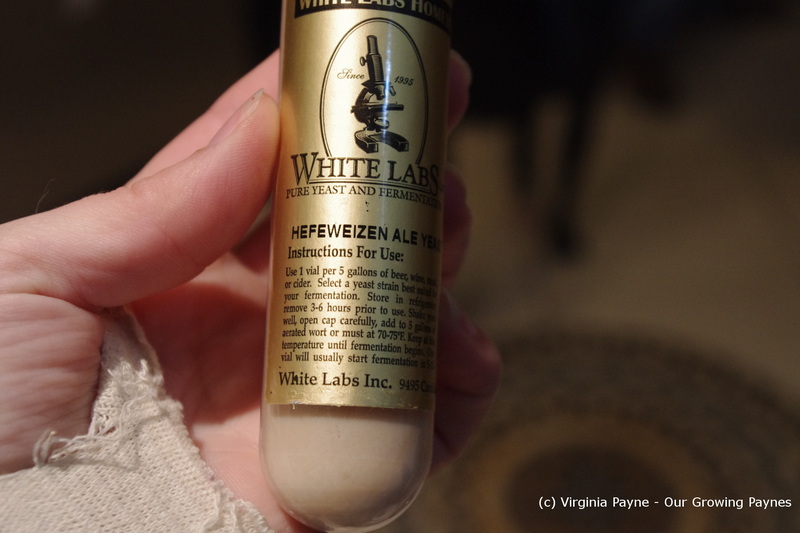 What we just made is a Hefeweizen. I love this beer and while very easy to make it is also my favourite to date of all the beers we’ve brewed so far. And it is perfect for dishes like homemade onion rings. 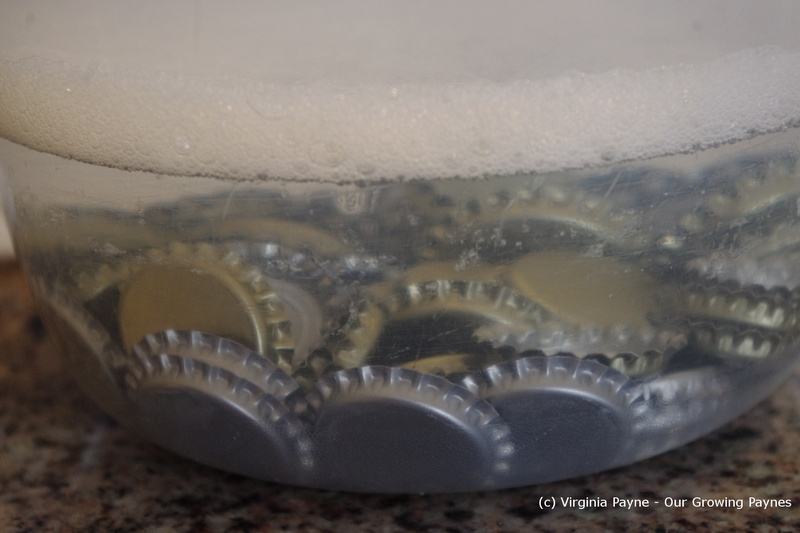 To start it is very important to sanitize anything that will touch the beer. 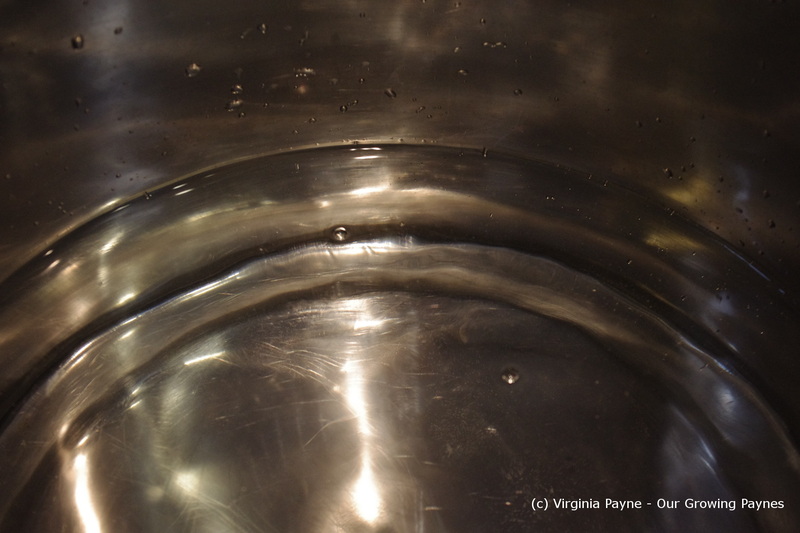 Add about 1 1/2 gallons of water to your brew pot and bring to a boil. While that is coming to a boil add 3 1/2 plus gallons of water to the carboy. Get the ingredients from the kit together and ready. 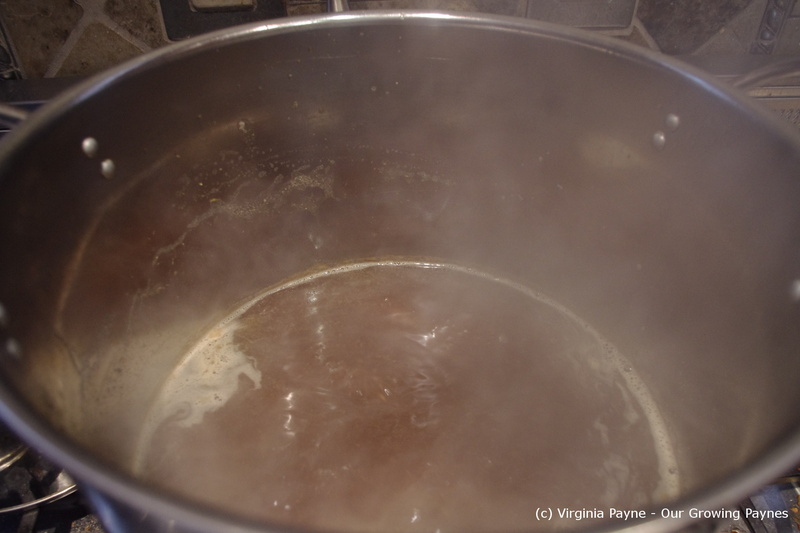 Once the water is boiling reduce the heat to low and add the dry malt extract to the water stirring as you do so. 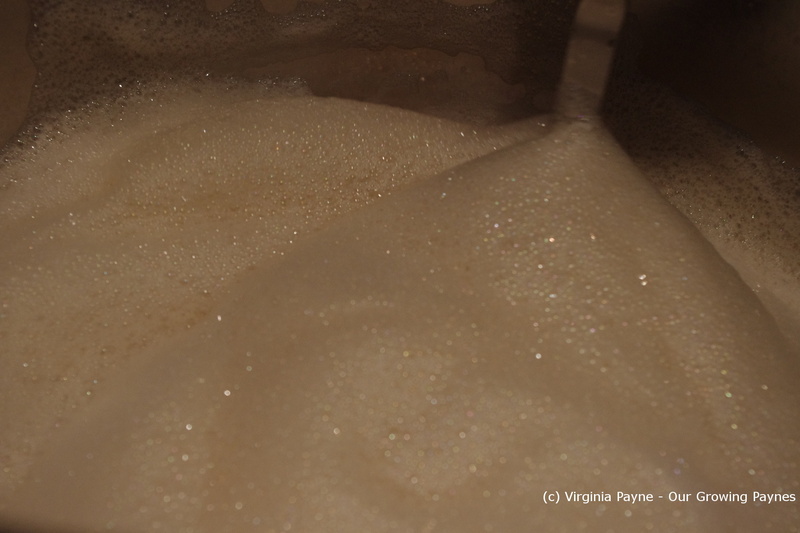 Sometimes, like it did this time the malt will form balls of taffy so before you bring it back up to a boil dissolve the malt into the water. Then bring it back up to a boil. It will foam. 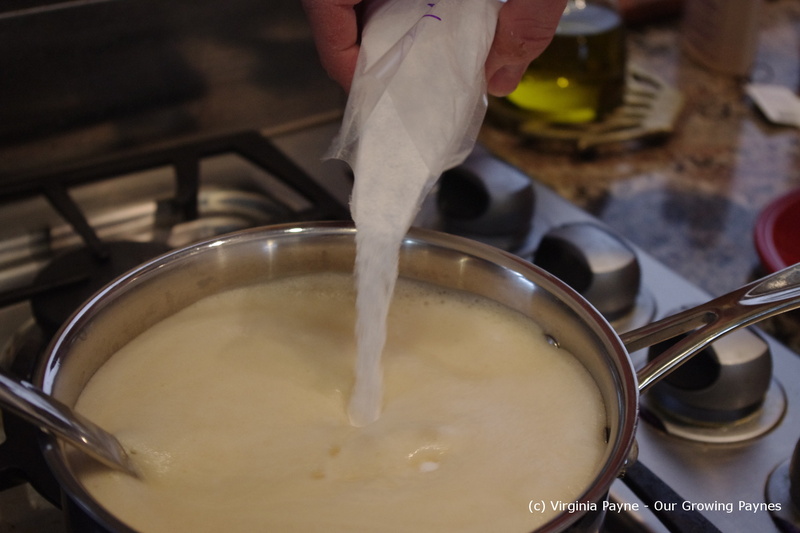 Reduce heat until the foam is nearly gone then boil again. 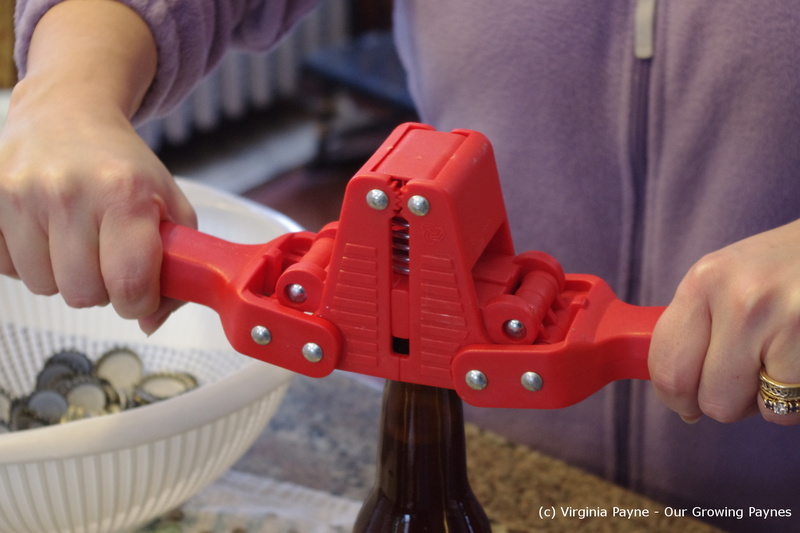 Now is the time to add the hops to the liquid. 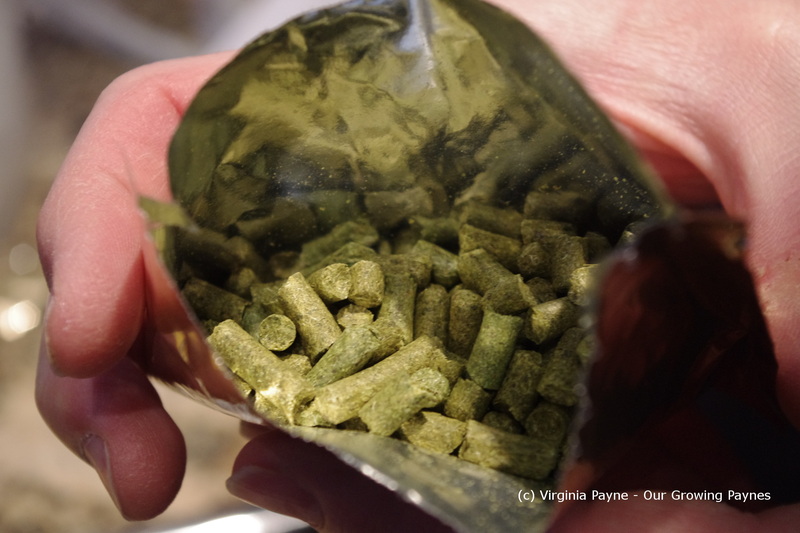 Most kits will label the hops with the boiling time. This recipe called for boiling it for an hour. 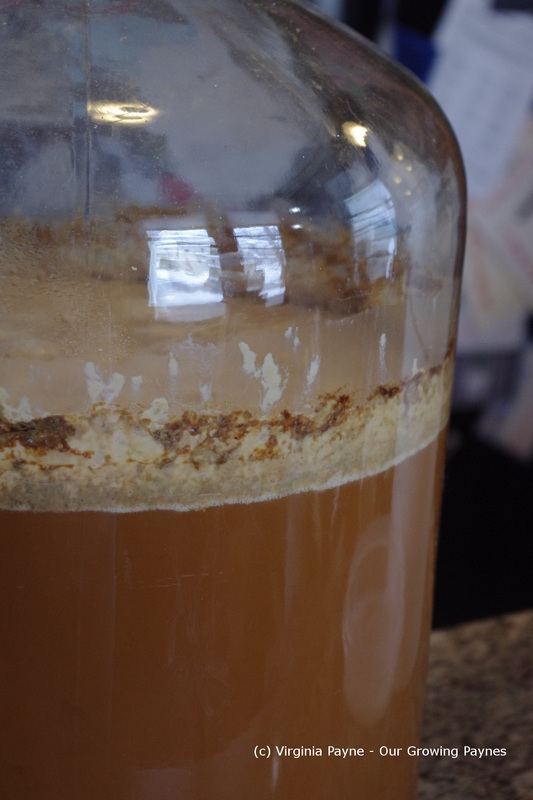 Once this is complete it needs to be poured into the carboy. I don’t have photos of that as this was a two person job and there is a danger of burning someone. 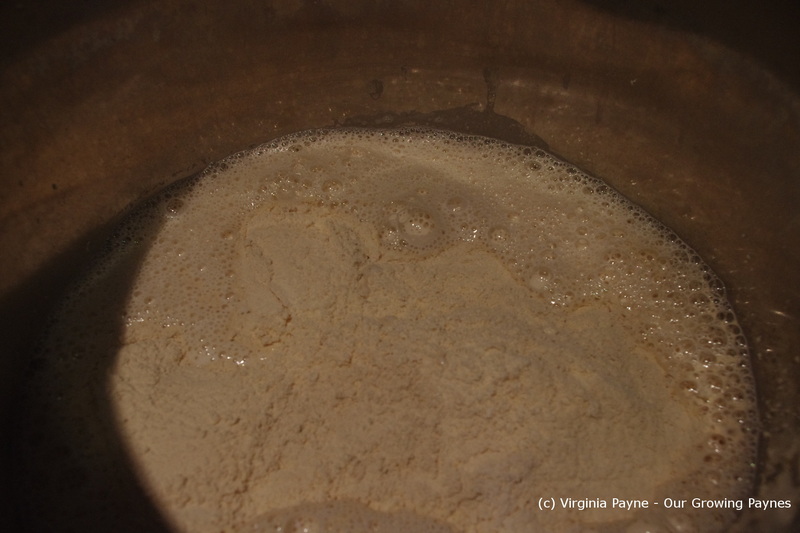 Once it has cooled a bit it is time to add the liquid yeast. Give it a good shake before pouring in. 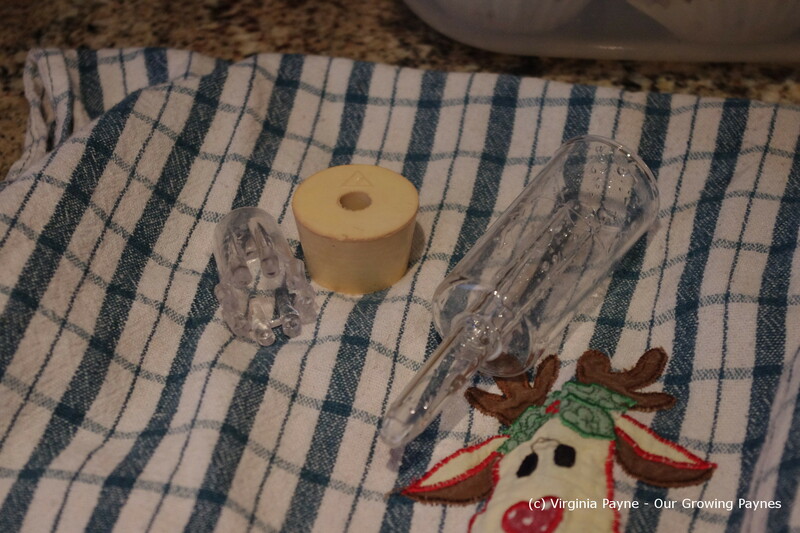 To get the dregs put a bit of water in and shake some more. 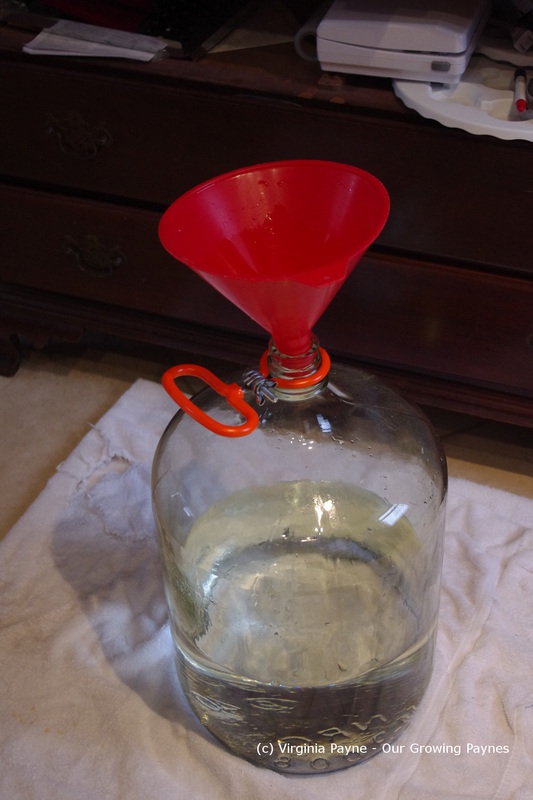 Insert the airlock with the water to the top of the carboy. The airlock allows the gases to come out but no air to get in. 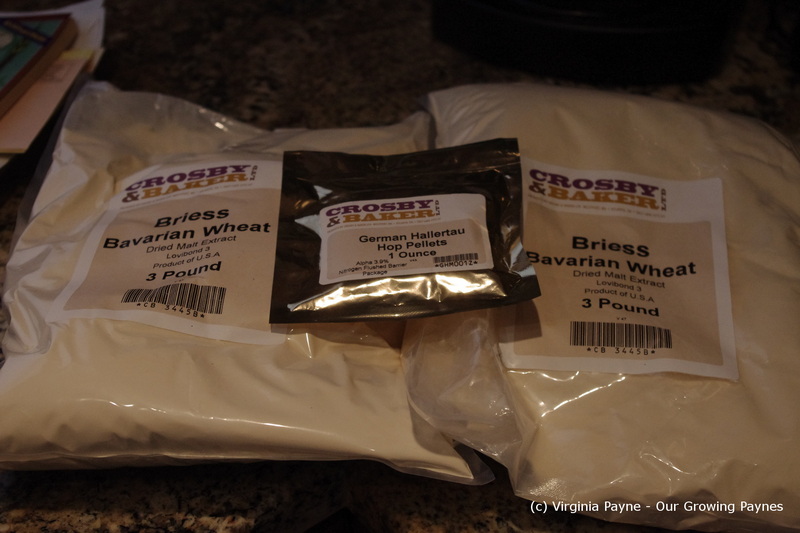 Store in a closet or a cool dark place for two weeks to allow the yeast to do its work. 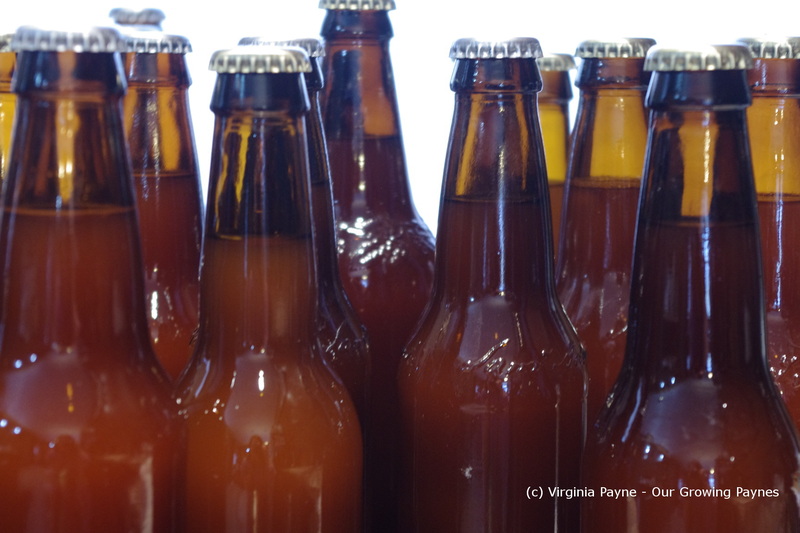 Then it is time to bottle. Again sanitize anything that will touch the beer. Very important! 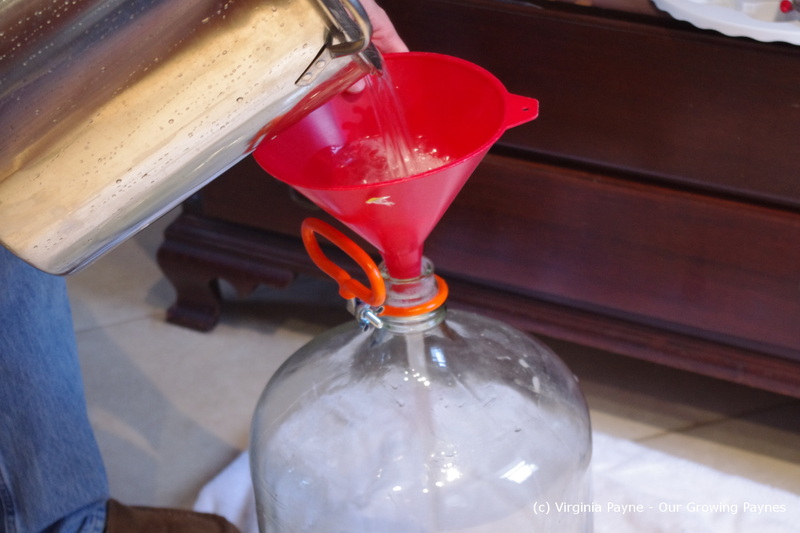 The beer needs to be transferred from the carboy to the bucket you use for bottling. This bucket has a tap at the bottom. 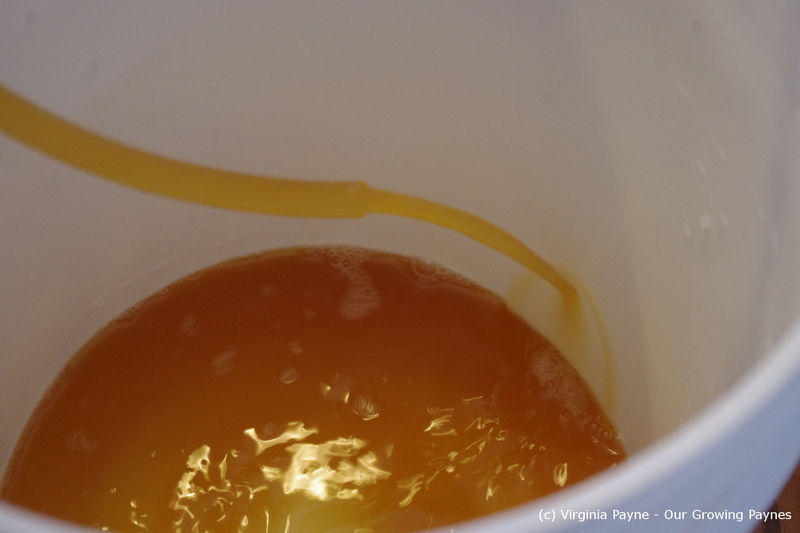 Next you need to put some of the beer into a pan for the priming sugar. 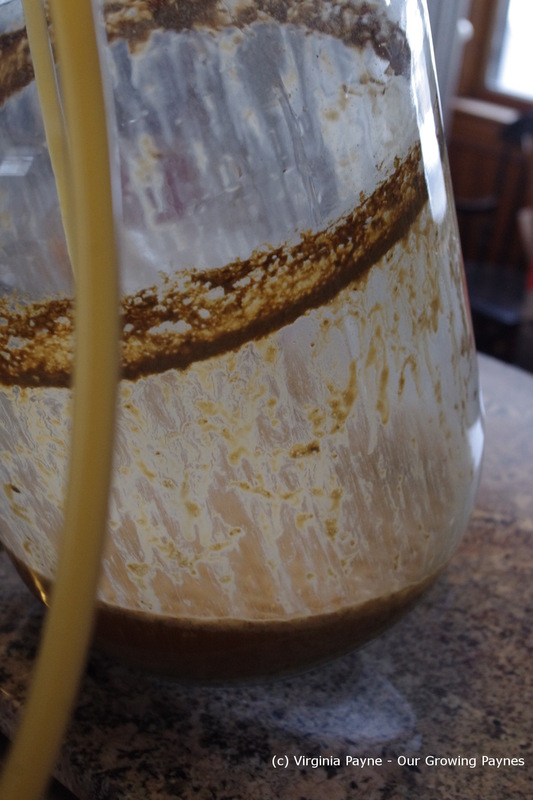 You don’t want to siphon the dregs from the carboy. 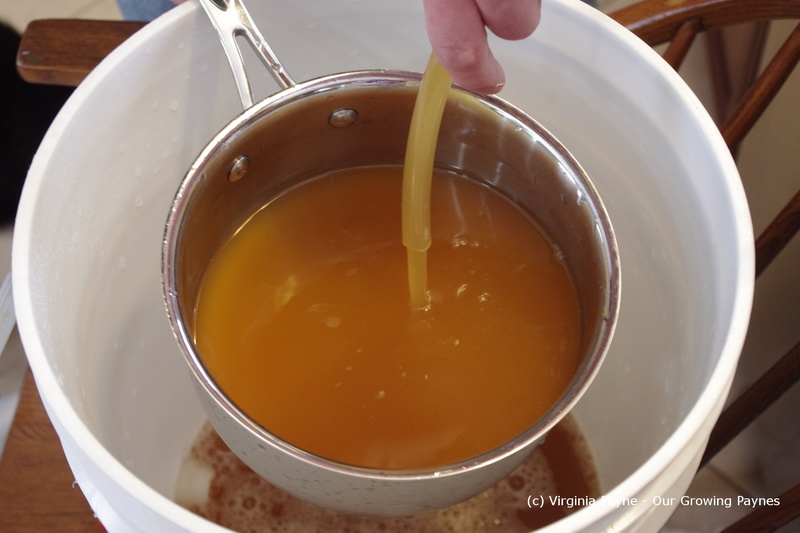 Once the beer in the pan is hot, add the priming sugar and then bring to a boil to dissolve. 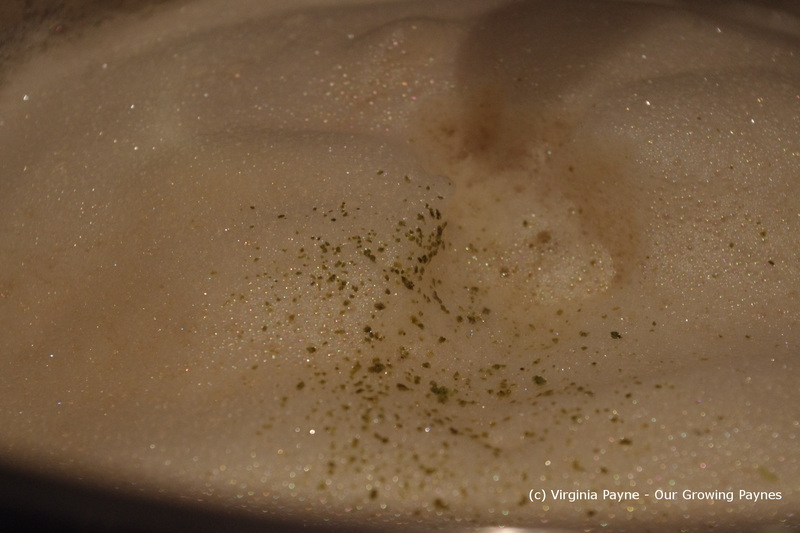 It will foam up quickly so watch that and remove from the heat if the foam gets near the top until the foam settles back down. Add it back into the beer batch. Now it is time to bottle. 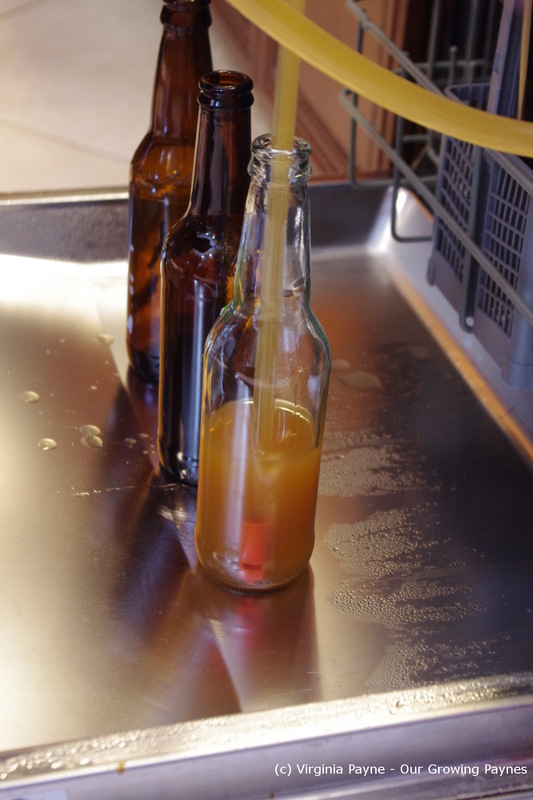 We are lucky that our dishwasher has a sanitize feature on it so we run the bottles through just before we bottle. Do check each bottle to make sure there isn’t anything stuck at the bottom of the bottle. And then start filling the bottles. 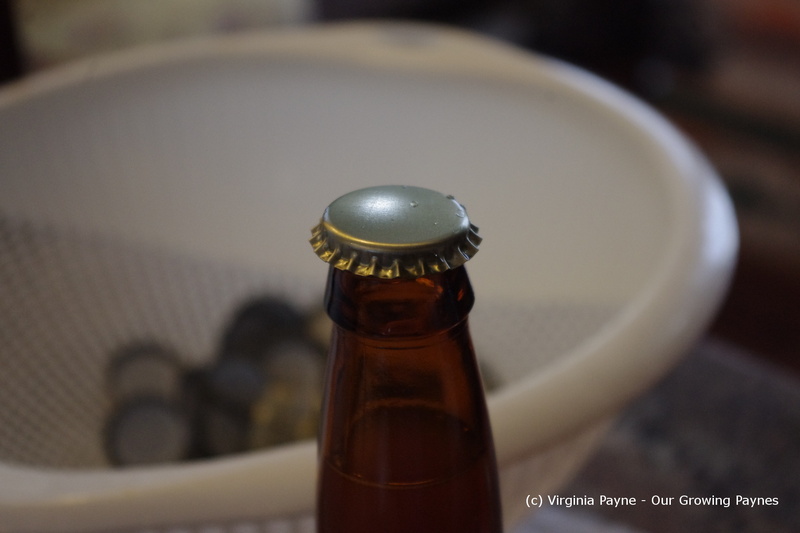 Place the cap onto the bottle. We have a handy tool to tighten the caps. This batch will make a few cases of beer. Label and store for 4 weeks in a cool dark space before you drink it. 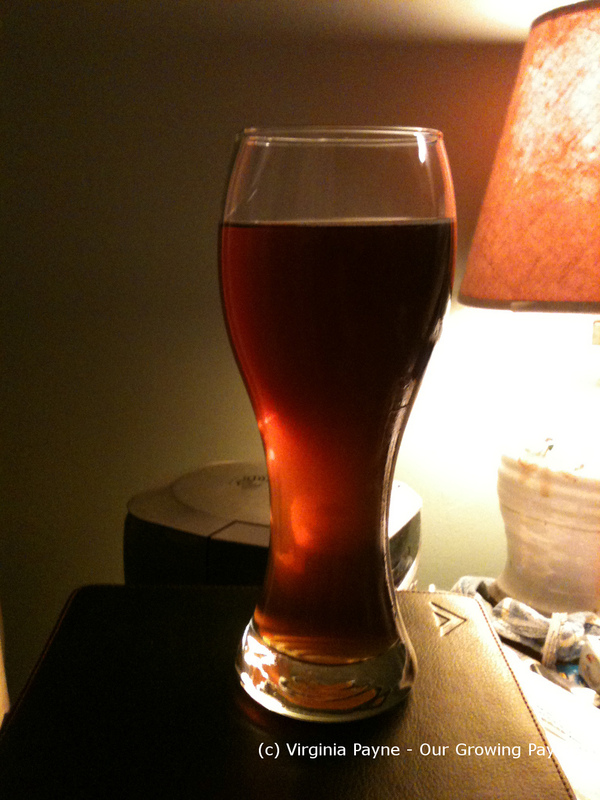 This entry was posted in Brewing Beer, recipes and tagged beer, brewing beer, hefeweizen, home brew. Bookmark the permalink. Do you know the two beer companies have been battling for 106 years? 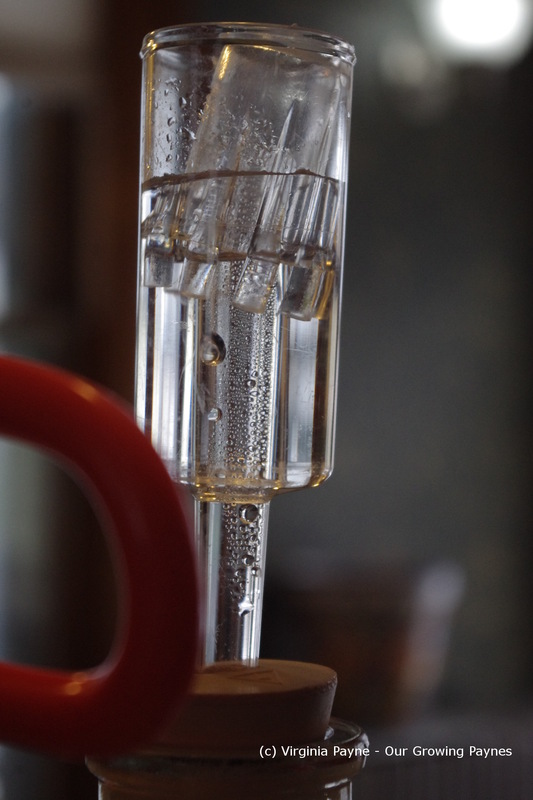 You should definitely try brewing. Tastes better and it’s a lot less expensive once you have the setup. We got a grill that has a smoker. It’s a wonderful tool to have. To make this beer it took about 5 hours all told to get this done. Most of the time is just waiting. what a great tutorial. I’m showing hubs right now as he loves a good hefe! Not a fan of Amer. Budweiser in the slightest and agree that micro beer is the way to go. I’m not far from a home brewery shop that I patronize for chemicals used in making some cheeses and for fertilizer for my garden. I’ve spoken with the staff about home brewing but I’m just not ready to make the leap. Should I ever decide to do it, though, I know now where to come for some helpful advice. This is a great “how to” post, if ever there was one. Thanks for taking the time. And the strange thing about the American Bud it that they are limited to the alcohol content here in the US. If you have it overseas it’s about double the content. So it’s even more anemic here. Wow! I love beer. Good beer. But, I’ve always been intimidated by the process of making it. You make it look easy. 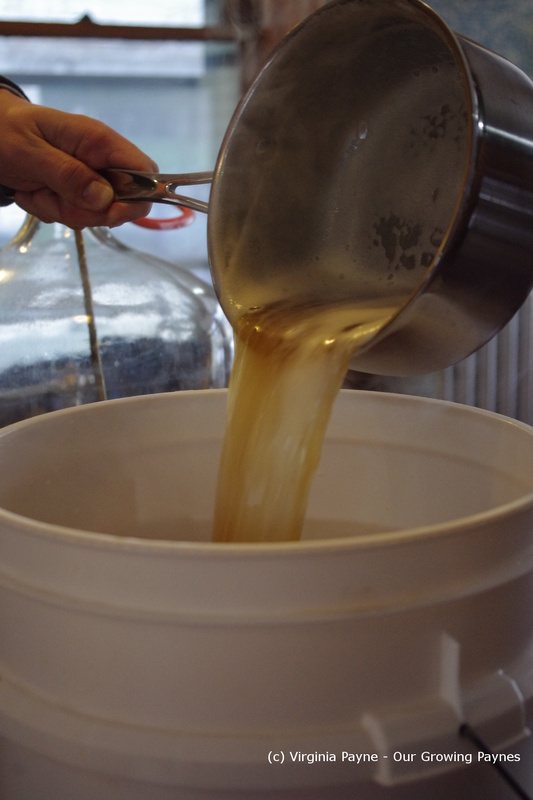 — Have you ever brewed an IPA? Yes we did an English IPA last year. It’s a bit stronger than an American IPA. We’ve also done a cream stout, pilsner, Octoberfest, and a few others. Oh and Extra Special Bitter. Next up is one like the Black Sheep Ale you get in England. It’s not overly hard with kits. A friend of ours makes his own recipes. We’re aren’t quite at that level yet but someday. You are very kind. 🙂 And thank you for reblogging my post! I’m flattered. This looks so wonderful… not sure I could do it, but I’m impressed. The kits take out the guessing when doing this. 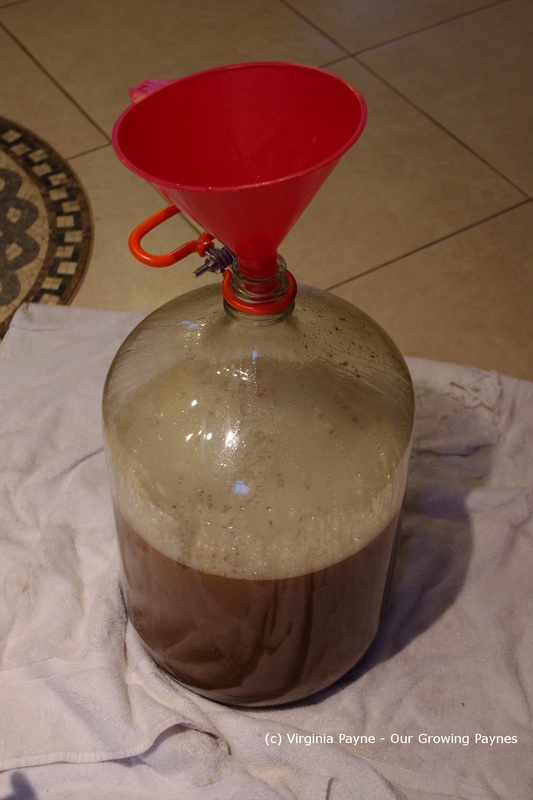 Some kits are harder than others but all skill levels can make great beer. 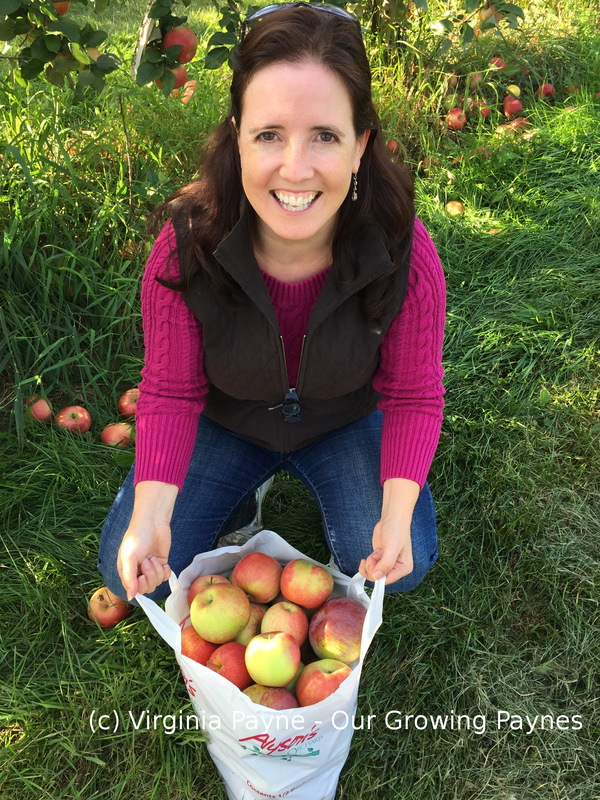 It’s a lot of fun but some aspects involve heavy lifting. So if I do it my husband has to help me.